In April 2016, I wrote about Dexus's (DXS) bid to acquire the Investa Office Fund (IOF) and how rival Cromwell (CMW) acquired a 9.8% stake in IOF (at $4.24 per share) that assisted in defeating the proposal. Fast forward to December and CMW revealed they had approached the Board of IOF to purchase the Fund with an all-cash offer of $4.45. Interestingly, this announcement did not come from IOF but rather from CMW, two weeks after it first approached the Board and after a related but separate party of IOF had purchased an 8.9% stake at the materially lower price of $4.23. 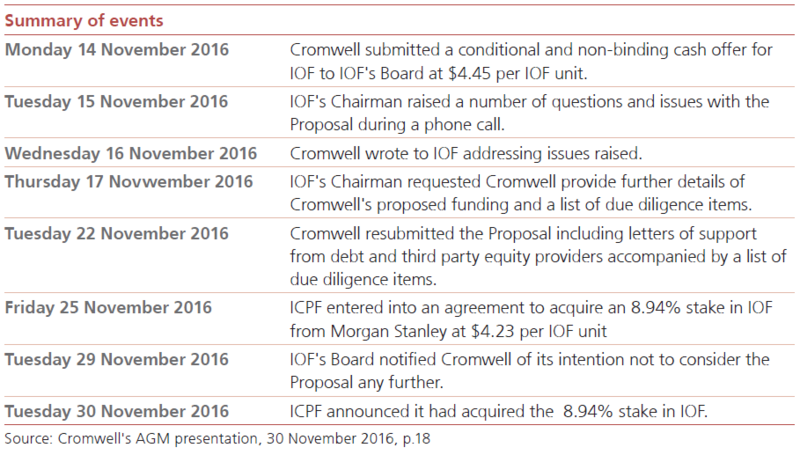 IOF’s Board dismissed the A$4.45 all-cash offer as not attractive or compelling and questioned CMW's ability to finance this deal, thus the Board chose not to disclose it. Whilst it was highly conditional and non-binding, as a unitholder I believe it would have been prudent to tell the market. It's not as if the bid came from a private equity firm (recall the infamous David Jones's $1.6bn takeover bid in 2012), but rather from a listed and respected ASX rival. I wouldn’t be too happy if I had sold a major stake below the proposed offer. Expect many questions to the Board about IOF’s corporate governance and why investors should now support their mooted plans to internalise. We have small legacy holdings in a few REITs from the mid 2000s. Correspondence to unitholders has never been a strong point. Blaming everybody else for disastrous GFC performance and sighting management skill for the subsequent improvement comes to mind. As these holdings include both IOF and DXS, I can fairly state neither side's handling of that bid inspired confidence. Now we have another round with IOF and Cromwell. I think we probably retain the units more for entertainment value than anything. Incidentally, after adjusting for the 2012 4 to 1 consolidation, IOF units are worth about 20% less than what they were a decade ago. Another great piece from Australia's preeminent property analyst. There are worrying signs of the A-REIT sector falling back into some very poor pre-GFC habits. This is a good example.